In this important new book, leading cultural theorist and philosopher Bernard Stiegler re-examines the relationship between politics and art in the contemporary world. Our hyper-industrial epoch represents what Stiegler terms a katastroph of the sensible. This katastroph is not an apocalypse or the end of everything, but the denouement of a drama; it is the final act in the process of psychic and collective individuation known as the West. Hyper-industrialization has brought about the loss of symbolic participation and the destruction of primordial narcissism, the very condition for individuation. It is in this context that artists have a unique role to play. When not subsumed in the capitalist economy, they are able to resist its synchronizing tendency, offering the possibility of reimagining the contemporary model of aesthetic participation. 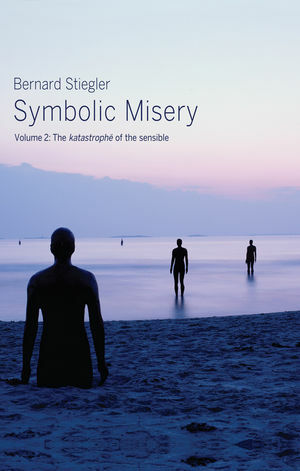 This highly original work - the second in Stieglers Symbolic Misery series - will be of particular interest to students in philosophy, media and cultural studies, contemporary art and sociology, and will consolidate Stieglers reputation as one of the most original cultural theorists of our time. "What links Andy Warhol, Bela Bartok, Glenn Gould and Joseph Beuys? This, says Stiegler: each in his own way understood the decisive changes brought about in the arts by their entanglement in networks of industrial production and commercial consumption, and each also realized that this entanglement called into question whether any of us - actual or merely potential artists - could any longer be said to participate in the creation and circulation of symbols. This is the question of what Stiegler terms symbolic misery, and he answers it with characteristic defiance. If we are indeed excluded from such participation, then the possibility of overturning this state of affairs is everywhere around us: in precisely those technical forms we more usually experience as feeding our addiction to alienation. All that is needed is to transform these from poison into cure, which is to say: to learn how to use them! This is a work of sober, impassioned understanding." "In Symbolic Misery one of Europes leading contemporary thinkers offers indispensable insights into modern technology and its influence on the ways we come to think and feel. Stiegler does not simply diagnose a collective malaise, however; his writing is a call to arms and a programme for a total rethinking of our relationship to technical objects."